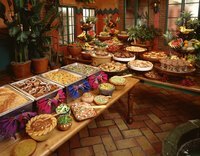 Buffets are an easy way to serve food to a large crowd of people, yet they often carry the stigma of sneeze guards, heat lamps and cold, stale foods. Shatter the expectations of your guests by presenting buffet food in a fun, creative way. A well-executed buffet will put your food in the spotlight and keep your guests coming back for seconds. Although white tablecloths are commonly used in buffets, they are easily stained and add nothing to your display. Instead, pep up your buffet table with an injection of color. A colorful tablecloth will hide stains better and create an inviting atmosphere. Garnish each dish using colorful edible items, such as fruit. Create different levels by placing boxes or shelves under the tablecloth. Using different levels also allows you to serve more food in a limited space. Your guests can eat with traditional cutlery on traditional dishes at home, so give them new options for enjoying their meal at your buffet. Serve food on bamboo skewers so that guests can eat with their hands. Use disposable Chinese take-out containers instead of plates so that guests can take some food home with them. Instead of a platter, serve food out of muffin tins, cookie jars or other unique containers you can find in your kitchen. Everyone knows that the best buffet items are the first to go, so give your guests perfectly portioned servings and there will be enough for everybody. Instead of a big serving dish of mashed potatoes, fill smaller ramekins or shot glasses with a single portion. Food items can be served from any small container, from cupcake wrappers to Chinese spoons. With smaller servings of food you have better flexibility when it comes to arranging buffet displays. A central theme helps to give your party focus and your table decoration some direction. If you are serving seafood, decorate the buffet with a blue table cloth, fishing net and plastic fish. Give your guests a taste of foods from around the world and add decorative objects from each country that is featured, such as an Eiffel Tower for French cuisine. Cover the table in beads and paper masks and serve Creole cooking for a Mardi Gras party.